The Junior Interregional Championships is an annual competition between the twelve Junior Regional Squads. First organised by YHOA in 1989 the competition is organised in rotation by the 12 Regional Associations. For many years it took place in late June but has recently changed to the early autumn. Each region enters a team made up of up to 4 M/W14’s, 16’s and 18’s – a total of 24 athletes. The relay teams are made up of one M/W16 plus one M/W14 plus one M/W18. being 8 teams in all per Region. Every effort is made to accommodate the teams in one location. The hosts arrange for dinner on the Saturday and a breakfast and packed lunch on the Sunday. Accommodation is usually on the floor of a sports hall or in somewhere like an army barracks. 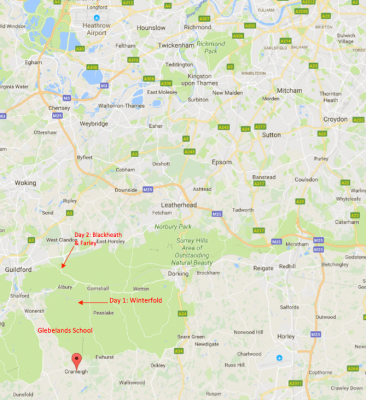 On behalf of SEOA, welcome to the Surrey Hills Area of Outstanding Natural Beauty for JIRCs 2017. We hope you enjoy two days of good competition against friends from far and wide in Winterfold and Blackheath, and the opportunity to make socialise together on the Saturday evening. No previous maps of area permitted in pre-start areas: In accordance with rule JIRC rule 8.1.5 no maps (previous or current) of the competition area are permitted at the pre-start areas. Disqualification of the whole team may occur if this is seen to happen. Conventional Sportident punching will be used. If a unit fails, please use the pin punch to punch the map. Competitors without their own dibbers should collect a hire dibber from Enquiries before they progress to the start on day 1. Hire dibbers will be collected after the competitor has run their relay race. Please make sure all hire dibbers are returned before you leave on Sunday. The events will be run in accordance with the relevant Rules of British Orienteering. Competitors should initially discuss any concerns they have with the Organiser, Planner or Controller, depending on the problem. If that does not resolve the issue a complaint should be made to the Organiser, via Enquiries, either orally or in writing. The complaint should be made as soon as possible after the problem has been identified and at least on the day that the contravention occurred. A protest against the Organiser’s decision must be made in writing to the Controller. If either official does not agree with the protest a jury will be convened. An emergency contact number will be printed on the map. A First Aid kit will be available at Enquiries. The nearest A&E department is at Royal Surrey County Hospital, Egerton Road, Guildford, GU2 7XX. Competitors must wear full leg cover and should remember to check for ticks after racing. If very high temperatures are expected competitors should ensure they are well hydrated prior to racing. Winterfold and Blackhealth are popular with dog walkers, mountain bikers and horse riders and we are sharing the areas with them; please treat all other users with respect. Competitors must all be aware of fast moving mountain bikes in the forest. Ash dieback disease – please help prevent the spread of this disease by washing your footwear and car wheels with soapy water before the event. 3.5 miles south of Shere (just off A25 Guildford to Dorking road) adjacent to Hurtwood Car Park No.3, Pitch Hill. Nearest Postcode is GU6 7NN. Grid Reference TQ079 426. Please take care as approach roads are narrow and not suitable for buses. We will have a specific area of the car park for our use. In the event of this becoming full we can use some of car park no. 3. Please note that car park no. 3 is heavily used by mountain bikers in the morning and you are advised not to arrive before 11:30 am. Call up will be -4 minutes. Runners must keep to their allocated start time. Start times will not be changed at the start. In exceptional circumstance (e.g. team late arrival), the organiser may reassign start times for the affected runners. In such cases, team managers should contact Enquiries as soon as possible. • In several places there are narrow white runnable corridors which are either natural or have been improved to make competition fair particularly for early runners. • Many small rhododendron bushes are unmapped. Thickets have been fully updated close to control sites where they are vital for navigation. • There may be additional unmapped hides. They have been fully updated close to control sites where they are vital for navigation. • Whilst every effort has been made to update paths and tracks, the area is well used by mountain bikers so there may be additional unmapped bike tracks/changes to existing ones. Maps will be collected from runners at the finish. They will be returned to squad managers after the last start time. The area is a mix of gentle and steep slopes, with many re-entrants, gullies and paths. There are also sections of detailed broken ground. Whilst runnability in winter is generally good, in summer large parts of the area are carpeted in bracken. Courses have been planned to take you to the best parts of the area, least affected by bracken and linking these with longer route choice legs through the path network. There are keep out signs on the area. They can be ignored because we have permission. All roads are out of bounds except at marked crossing points. Competitors must not enter the settlement areas and should stay clear of any moving forestry vehicles. No forestry work is planned but as vehicles/machinery are parked in the forest they may be en-route to elsewhere. There is an area of crags/severe slopes close to the finish. These will be taped at the top with black/yellow hazard tape. M/W14 & M/W16 have 1 mandatory road crossing. 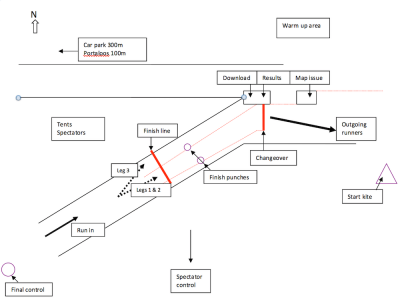 Competitors should punch the control immediately before the road crossing, follow the taped route to the road crossing and follow tapes on the other side of the road to the next control. The section between these controls will be fully timed out. You may take as long as necessary to cross the road safely, following guidance from event marshals where given. M/W18 have 3 road crossings. The first is mandatory. The 2nd is mandatory and fully timed out. The final road crossing is optional. One valid route choice may take runners through the mandatory crossing point on the M/W14 and M/W16 courses. To avoid confusion, separate running lanes will be set out on the approaching path and signed for the appropriate course. M/W18 should use their signed running lane and may cross the road at their own discretion. The mandatory road crossings will be manned. Please obey the marshal’s instructions. Competitors to be aware of fast moving road bikes as well as vehicles when crossing roads. At 17:00. All competitors should download by this time even if you have not completed your course. Runners must carry a whistle and this will be checked at the start. 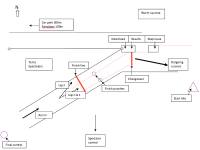 In the event of a competitor getting lost they should follow a safety bearing South and then proceed either west or east depending on the block of forest they are in. Two portaloos will be provided in the car park. Glebelands School, Parsonage Road, Cranleigh, GU6 7AN. Parking is available on site. There are two accommodation halls – the sports hall and the gym. Upon arrival team managers should head to the sports hall to register their team, and receive instructions on where the team will be sleeping. Sleeping will be on the floor, so mats and sleeping bags will be required. There are 8 male showers and 6 female showers in the sports hall building, along with toilets and changing areas. In order to not have long queues for the showers, it would be helpful if squads could aim to have their showers in the half hour before their dinner slot. There are also toilet facilities in the gym building. The buildings are separated by an unlit playground – torches are recommended. Please remove muddy shoes in the hall foyer to avoid traipsing mud throughout the buildings. There will be fruit available on arrival – 1 piece each please. Dinner of lasagne and pudding, with vegetarian and other dietary requirement options available, and a bottle of water will be served in three sittings in the dining hall. Team managers will be told which dinner sitting they have been allocated when they register. Please stick to your time allocations to help us manage serving and sitting loading. A breakfast of cereals, brioche rolls and a carton of juice will be served from 6.30am. Packed lunches for Sunday will be provided, and will be delivered to the relay during the event. Water fountains are available in the dining area. The team managers’ meeting will be held in the meeting room in the gym building at 8.00pm. Team declaration forms will be handed out to team managers on arrival at the accommodation. All relay registration forms must be returned to the SI team (based in the meeting room in the gym building) before the team managers’ meeting. We aim to distribute bibs to the team managers on Saturday evening. The prize giving will be held in the dining hall at 9.00pm, where individual and team prizes from the first day of competition will be awarded. Current trophy holders, please return your trophies to Enquiries on day 1, or to one of the organising team prior to the team managers’ meeting. Please note that all the approach roads to Blackheath are extremely narrow. 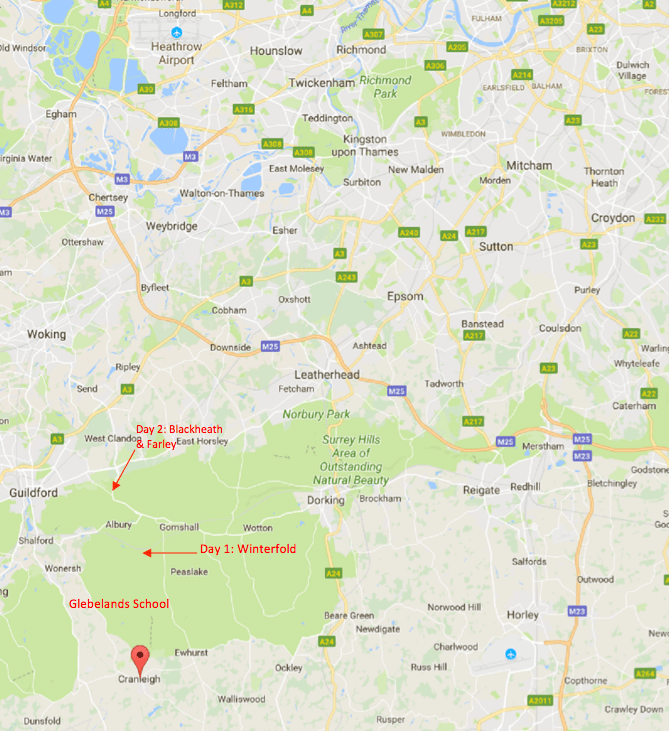 From Glebelands School, Cranleigh head to Wonersh, from where the event will be signed. Turn right off the B2128 along Blackheath Lane to the crossroads in Blackheath village. Carry straight on here and turn left into the old pub car park a few hundred metres further along. Please note that parking is very tight and we may have to block some vehicles in. Please inform the marshals if you need to get away promptly at the end. It would help if teams could minimise the number of vehicles they bring to the car park at Blackheath. Some vehicles may need to be parked nearby on the road - please follow marshals’ instructions. We cannot use the small public car park to the east at the end of Blackheath Lane. We don’t have space for coaches in the car park and instructions will be given on Saturday evening for dropping off and alternative parking arrangements. 300 metres from the car park. Leave the car park and head east (left) along Blackheath Lane following tapes, through the public car park and straight along the footpath. This is a residential area, please remember that it is early on a Sunday morning and be as quiet as possible. Watch out for any traffic on this very quiet road. There is room for tents alongside the run-in. All competitors and spectators should stay to the north of the taped run-in and finish area. See diagram of Assembly layout below. Bibs are red (Leg 1), white (Leg 2) and blue (Leg 3) with black numbers. Mini Mass Start 11.00am, if required. There is a small amount of climb on all courses, e.g. 25m on a typical M18 course. The 18s will be on the lower end of their EWT range and the 14s on the higher end of theirs. Tapes will show where you can warm up before your run - broadly, it's behind you as you look across the run-in at the heath. There will also be a small area for warming up after you've taken your map. Maps will be issued to runners as they enter the changeover area - please do this in good time. Incoming runners on legs 1 and 2 will pass the finish, punch the finish control then touch their team-mates to send them off. Incoming runners on leg 3 will have a different (parallel) finish chute and should also punch the finish control after they have crossed the finish line - please keep in order of finishing! There should be lots of opportunity for spectating as the area is quite open. There is a spectator control on a bush straight ahead of you across the heath for all courses. There will be about 7-10 minutes' running left after that. 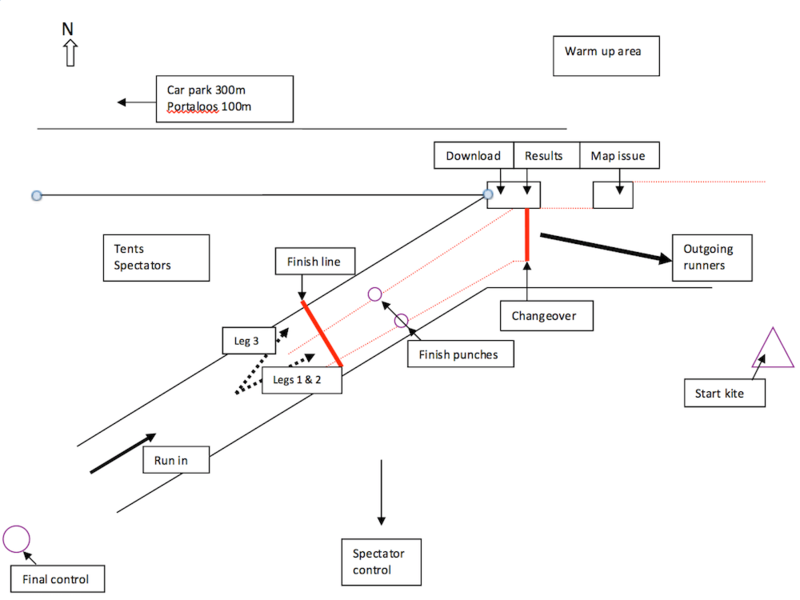 The run-in (and run-out) allows for good spectating too, and you might be able to see runners as they approach the final control through the forest. The cricket pitch in the west of the map is out of bounds (and hatched on the map), and ALL ROADS ARE OUT OF BOUNDS - though if you're on either road, then you are in the wrong place anyway. At 12.00. All competitors should download by this time even if you have not completed your course. As soon as possible after completion of the races. There will be portaloos in the public car park 100m west of Assembly. We are not providing water, so make sure you bring your own supply. Each region will be provided with packed lunches during the event. No other food is available.